At the Gateway Cities English Springer Spaniel agility trial on November 13, 2016, Chewey got a Master JWW Q earning 9 MACH points. 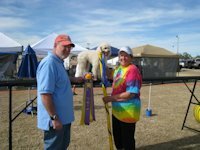 At the Golden Retriever Club of San Diego agility trial on October 29, 2016, Chewey got a Master JWW Q earning 11 MACH points. 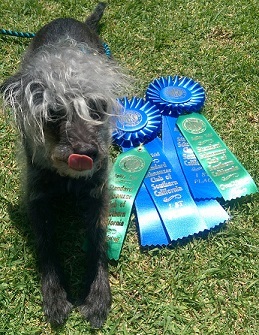 At the GCESSA AKC agility trial on Nov 13, Pomona got a 2nd place Q in Masters Standard earning 6 PACH points. This Q was one of four qualifying scores in the Masters 8" dogs for the Standard run. At the GCESSA AKC agility trial on Sept 24 2016, Pomona got a 1st place Q in Masters Standard earning 6 PACH points. 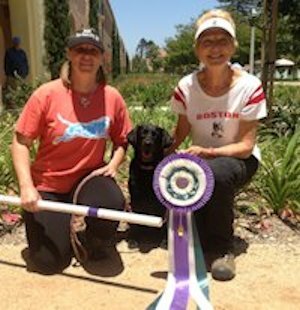 On July 16, 2016 at the San Diego Agility Club trial, Ellisa and Nala earned their 2nd qualifying run and 1st place in the Open Standard class. 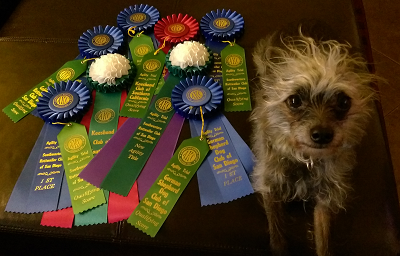 At the GRCSD AKC agility trial on July 2-4 2016, Chewey got two 1st place Qs in Excellent Standard, moving him up to Masters for Monday. On the JWW side, he got one 2nd place Q (11 MACH points), one 4th place Q (12 MACH points), and one more Q (11 MACH points)... for a grand total of 34 MACH points in one weekend !! At the GRCSD AKC trial on July 2-4 2016, Pomona got a 4th place Q in Excellent Standard on Saturday, moving her up to Masters Excellent!! On the same day, she also got 8 PACH points in Masters JWW ! On Monday, Pomona got a 1st place Q in Masters Standard with 4 PACH points... the only dog in the 8 in. jump height of Masters Preferred to qualify ! 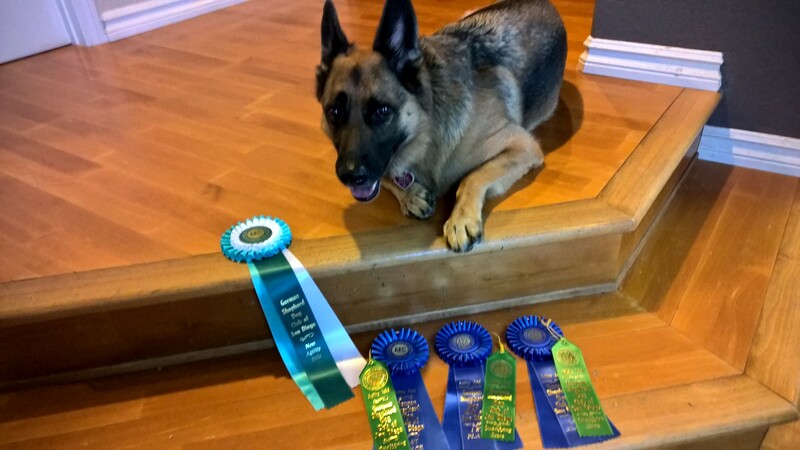 At the PDT ASCA agility trial on June 18th and 19th 2016, Chewey got two first place Qs, one in Open Gamblers round 3 and one in Elite Standard round 2. At the SSCSC AKC trial on June 11th 2016, Dia got her second Q in her AKC agility career - a first place Q in Novice JWW !! At the SDRRC AKC trial on May 22nd 2016, Dia got her first Q in her AKC agility career - a first place Q in Novice JWW !! At the PDT ASCA trial on May 7th 2016, Dia got her first Q in her agility career - a first place Q in Novice Jumpers round 2 !! At the PDT ASCA trial on May 8th 2016, Pomona got two first place Qs in Novice Gamblers round 3 and Elite Standard round 3 !! At the PDT ASCA trial on May 7th and 8th 2016, Chewey got two first place Qs in Elite Jumpers round 1 and Elite Standard round 3. At the WCCSC AKC agility trial on April 10th 2016, Chewey got a first place Q in Excellent Standard. At the Agility Club of San Diego AKC trial on April 2, 2016 at Liberty Station, Chewey got a first place Q in Excellent JWW !! At the San Diego Rhodesian Ridgeback Club AKC Agility trial, March 26, 2016, Ellisa Beaver and Nala earned their Open Jumpers agility title. Nala ran clean and earned a first place in the class! 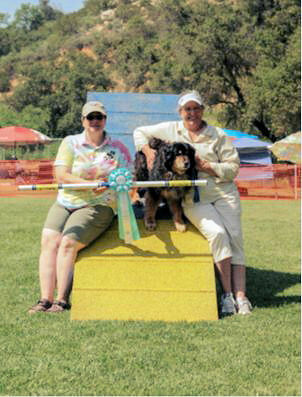 Ellisa and Nala also earned a qualifying score and a second place in Open Standard the following day in the same show. At the San Diego Rhodesian Ridgeback Club AKC trial on March 26, 2016 at Liberty Station, Chewey got a first place Q in Excellent JWW and moved up to Masters JWW !! On February 13th, 2016, Ellisa and Nala earned a Q and 1st place in the Open Jumpers class at the trial hosted by the Standard Schnauzer Club AKC trial. Hooray! At the Standard Schnauzer Club of Southern California trial on Feburary 13 & 14 2016 at Liberty Station, Chewey got two first first place Qs in Excellent JWW !! At the GRCSD AKC trial on January 23 2016 at Liberty Station, Pomona Q'd in Excellent Preferred JWW with a 2nd place !! At the ACSD AKC trial on January 17 2016 at Liberty Station, Pomona double Q'd in Excellent Preferred Standard and JWW with two 1st places !! At the ACSD AKC trial on January 17 2016 at Liberty Station, Chewey got his first Q and a 1st place in Excellent JWW ! At the PDT ASCA trial on December 12 2015 at Doyle Park, Pomona got 2 Qs, both in Open Standard ! At the PDT ASCA trial on December 12 2015 at Doyle Park, Chewey got a first place Q in Novice Standard ! 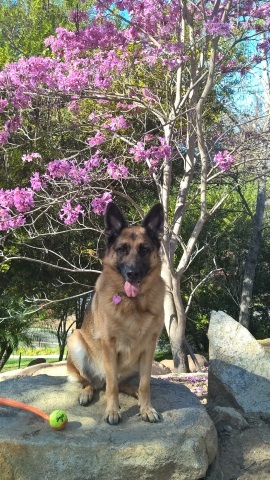 At the GRCSD AKC trial on December 6 2015 at Hourglass Park, Pomona got her final Q to complete her Open Jumpers Preferred title ! On December 5th at in AKC trial sponsored by the Golden Retriever Club, Nala Q'd and finished 1st place completing her Novice Standard title. She was the only dog in all jump heights to have a qualifying run in the Novice Standard class! Also, Nala Q'd and earned a 1st place in Open Jumpers with a clean run 4 seconds under allowed time. Yeah Nala! At the PDT ASCA trial on September 11 2015 at Doyle Park, Pomona got 3 Qs, 2 in Open Jumpers and 1 in Open Standard ! At the American Chesapeake Club AKC trial on a very hot August 23rd 2015 on a challenging course with a few tricky turns and a tricky weave entry, Pomona got the only Q (with a perfect score) in all of the height classes in AKC Open Standard !! 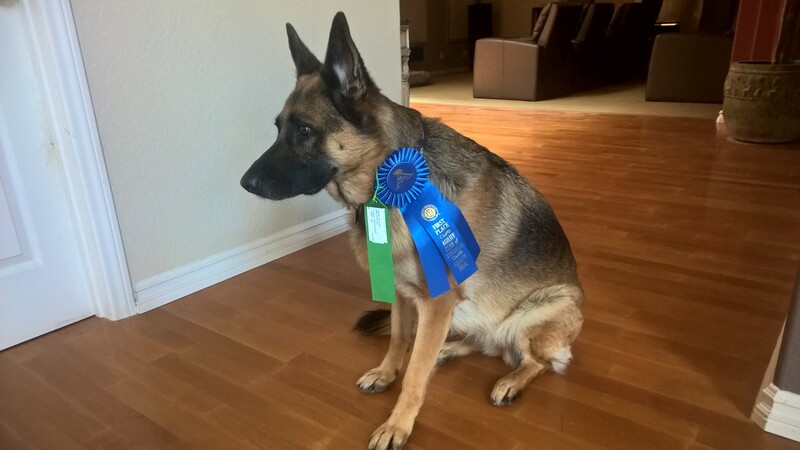 At the AKC agility trial hosted by the German Shepherd Dog Club of San Diego on Aug 1-2 2015, Nala and Ellisa received their first agility title in Novice Jumpers. Over the weekend trial, we ran 3 qualifying rounds and got 3 1st places (2 in Standard and 1 in Jumpers). This completed what we needed to move on in Jumpers to Open and leaves one remaining “Q” for us to move up in Standard. Progress indeed! At the Golden Retriever Club of San Diego (GRCSD) trial on June 27th 2015, Chewey got his 2nd Q in AKC Open STD !! At the GRCSD trial on June 28th 2015, Chewey got his 2nd Q in AKC Open JWW and his 3rd Q in AKC Open STD !! These two Qs in AKC Open STD got Chewey and Tim his OA title and moved him into Excellent Standard. At the American Chesapeake Club trial on August 23rd 2015, Chewey got his 3rd Q in AKC Open JWW !! This was one of only two Qs in the entire Open JWW class. This last Q got Chewey and Tim his OAJ Title moving into AKC Excellent JWW. At the Golden Retriever Club of San Diego trial on June 28th 2015, Pomona got her 2nd Q in AKC Open JWW !! At the Golden Retriever Club of San Diego trial on June 28th 2015, Nala got her 2nd Q in AKC Novice JWW !! At the PDT ASCA trial on Saturday June 20, 2015, Pomona got her third Q (1st place) in Novice Jumpers and Novice Standard! This got her moved up into Open for Jumpers and Standard !! 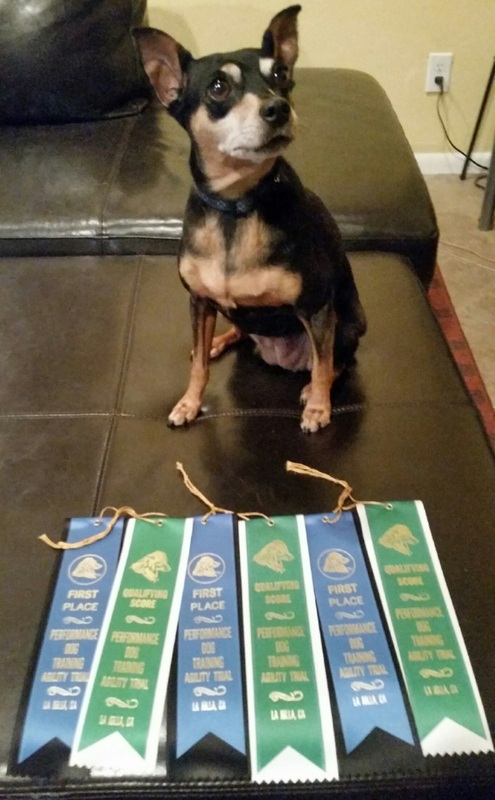 At the PDT ASCA trial on Sunday June 21, 2015, Pomona got her first Q (1st place) in Open Jumpers !! 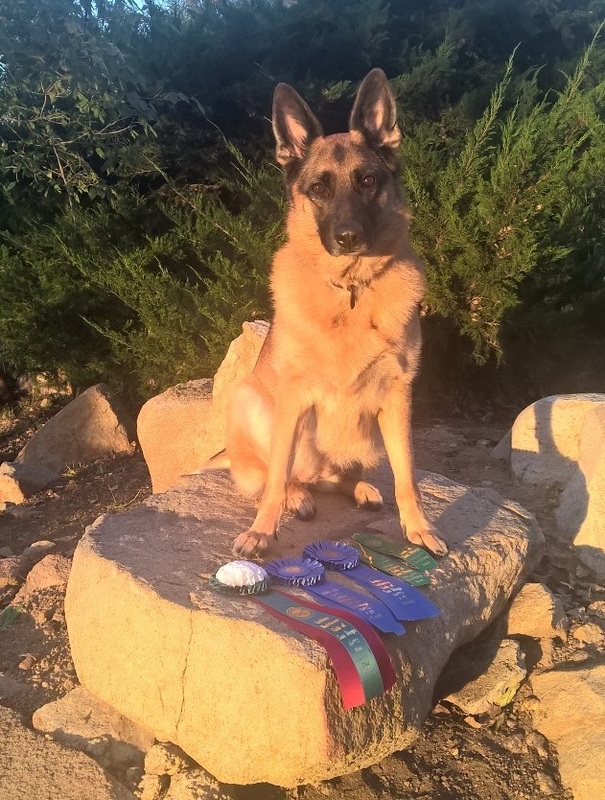 At the PDT ASCA trials on May 3rd and June 21st 2015, Chewey finished 1st place in two Gamblers 8" rounds. At the Bichon Frise Club of Southern California trial on Sunday June 14, 2015, Chewey ran T2B in 34:58 and got his second Q in T2B (9 points) !! At the Bichon Frise Club AKC trial at HVOC on June 13th 2015, Nala got her first Q in Novice Jumpers !! At the Standard Schnauzer Club of Southern California trial on June 6 and 7, 2015, Chewey got his first two Qs running in AKC Open !! At the Standard Schnauzer Club of Southern California trial on June 6, 2015, Pomona and Sam received their second Q (1st place) in Open Jumpers With Weaves ! At the Standard Schnauzer Club of Southern California trial on June 6, 2015, Pomona and Sam received their first Q (1st place) in Open Standard ! At the San Diego Rhodesian Ridgeback Club trial on May 17, 2015, Pomona and Sam received their first Q (1st place) in Open Jumpers With Weaves ! After taking classes with Sandy for almost a whole year, many headaches and a few glimmers of brilliance at numerous trials, Pomona is back on her game and running faster than two years ago. At the San Diego Rhodesian Ridgeback Club trial on May 17, 2015, Chewey and Tim got their first AKC Time 2 Beat Q !! At the PDT trial on May 3, 2015, Nala and Ellisa received their first Q (2nd place) in ASCA Novice Jumpers ! At the PDT trial on May 2, 2015, Pomona and Sam got their second Q (1st Place) in ASCA Novice Jumpers ! At the PDT trial on May 3, 2015, Pomona and Sam and their first Q (1st Place) in ASCA Novice Gamblers ! 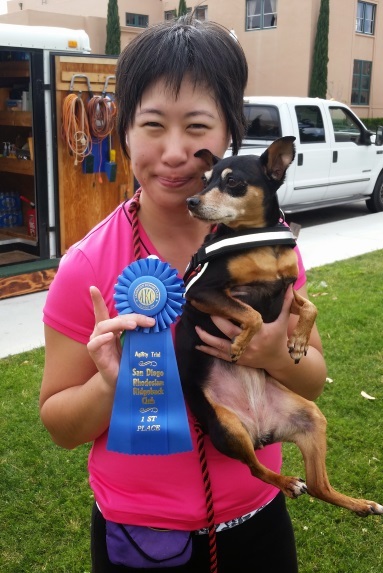 Pomona and Sam got their second Q (1st Place) in ASCA Novice Standard at the PDT trial on March 14, 2015! Chewey and Tim got a their last Q to get his NA title at the March 7, 2015 Keeshound Club of Southern California trial. His NAJ title was previously earned at the Southwestern Rottweiler Club of San Diego trial on November 30, 2014. Pomona and Sam got their first Q in ASCA Novice Jumpers and first Q in ASCA Novice Standard at the PDT trial on December 13, 2014! Pomona and Sam got their 2nd Q for T2B (10 pts) at the Golden Retriever Club of San Diego trial on October 25, 2014! 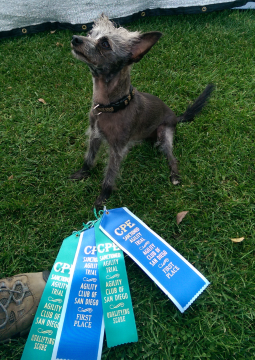 Chewey and Tim nabbed 3 Q's and 3 first places to earn the title Level 1 Standard - CL1-R in his first CPE trial on October 4-5, 2014! Kim and Noni got their MACH at the Bichon Frise Club AKC Trial on June 16, 2013 at Liberty Station. Rio got 8 Q's out of 9 Runs. He got a 4th placement in Fullhouse Level C, a 4th Placement in Standard Level 4, a 3rd Placement in Jumpers Level C, and a 2nd Placement in Standard Level 4. It was and AMAZING weekend and we were an awesome team! Noni and Kim went 9 for 9 and 4th overall for level in games. High reserve standard level 5! Theo and Jennie went 5 for 9 with a perfect, powerful, fast first place standard run to end on! On April 22, 2012, just one week shy of her 12th birthday, Cherokee completed her CT-ATCH, CPE's Enthusiast Championship title. The Enthusiast title allows dogs to run as "veterans" (allowing a bit more time and lower jump heights), and also to skip one of the 7 CPE classes entirely. Cherokee didn't take advantage of skipping a class; she completed the requirements in all classes for her championship- she's a great all-around agility partner!